We must eat a balanced diet for the overall growth and well-being of our body. Our body needs different nutrients to keep itself healthy and fit, and one kind of food cannot provide all the necessary nutrients. Hence, we must eat different kinds of food in the right proportion to maintain our body. Each nutrient has a unique role to play in the well-being of our body (e.g. Carbohydrates give us instant energy while proteins help in the growth and repair of tissues). Similarly, we need a balanced investment portfolio in life to ensure our financial well-being. 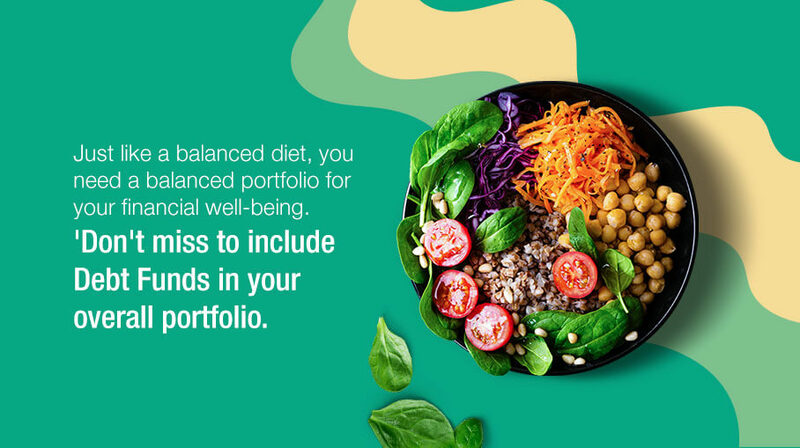 Within the portfolio, we need a mix of different kinds of assets that play different roles like the various nutrients in our diet. One should invest in different kinds of assets like equities, fixed income, gold and real-estate for financial security and prosperity. Individual investors may find it difficult to invest directly in some asset classes like fixed income, which includes bonds and money market instruments. Instead, they can invest in Debt Funds that invest in such securities. They offer lower but relatively stable returns, thus providing balance to your portfolio of equity, gold and real-estate investments.